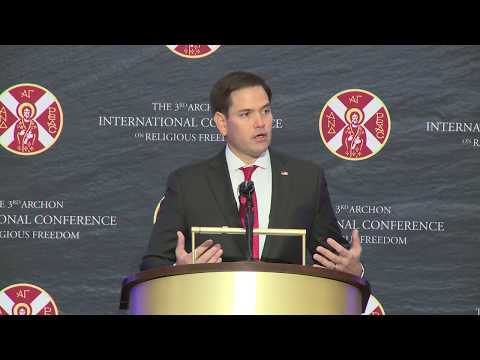 Address of Senator Marco Rubio at the 3rd Archon International Conference on Religious Freedom on the persecution of Christians in the Holy Lands and Middle East. Archbishop Demetrios of America, Primate of the Greek Orthodox Church in the United States, and Dr. Anthony Limberakis, National Commander for the Order of St. Andrew the Apostle, recognize Senator Marco Rubio for his dedication to religious freedom and his defense of Christians persecuted in the Holy Lands and Middle East at the 3rd Archon International Conference on Religious Freedom. Senator Marco Rubio addresses the 3rd Archon International Conference on Religious Freedom in Washington D.C. focusing on the persecution of Christians in the Holy Lands and Middle East. For more information about the conference, visit: http://conference.archons.org.